I conducted one of my last interviews as an immigration officer with the U.S. Department of Homeland Security in Istanbul with Mahmoud and his 8-year-old son from Aleppo, Syria. His son had lost his legs in the explosion that killed Mahmoud’s wife, sister and other children. It was supposed to be his son’s first day at school in two years. Instead, they were here in my office, reliving the worst experiences of their lives to come to the United States. Mahmoud trembled as he spoke about returning to his home from work one day and digging his family members out of the rubble. I had never been both so sad and proud that this boy would be able to come to the United States and start school and a new life. Now I imagine them, four years after leaving Syria and three after registering as refugees and being told to go back. Go back where? This is precisely what President Trump’s executive order issued last Friday did. The order bans entry for citizens of seven countries for 90 days, suspends all refugee admission for 120 days, halves the total number of refugees allowed into the United States this year, and halts refugees from Syria indefinitely. The order demands “a program… to identify individuals seeking to enter the United States on a fraudulent basis with the intent to cause harm, or who are at risk of causing harm.” It calls for “standard screening and procedure”, “questions aimed at identifying fraudulent answers and malicious intent”, “a mechanism to ensure that the applicant is who the applicant claims to be”, and “a mechanism to assess whether the applicant has the intent to commit criminal or terrorist acts”. During nearly four years as an immigration officer with Homeland Security, I conducted in-person interviews with hundreds of refugees in 10 countries from 20 different nationalities. I have had countless refugees break down crying in my interview room because of the length and severity of the vetting process. From that experience and numerous security briefings, I can affirm that whoever wrote Trump’s executive order blocking refugees from the United States is wholly unfamiliar with the U.S. immigration system, U.S. laws, international law and the security threats facing our nation. I can’t speak for all refugee and asylum officers, but I can say that those who have been working in immigration for years from opposite ends of the political spectrum are appalled by these new policies. Several years ago, Berivan left her home in the relatively safety of Northeast Syria to go to the capital Damascus to help people organize peacefully. She ended up being persecuted by the Syrian government and armed extremist groups, and was trapped in an area under siege by the Syrian regime. She paid the price for her pursuit of freedom in too many horrifying ways to mention. She finally escaped and fled with her husband to Turkey, where she put her English and Arabic fluency to work with humanitarian organizations. When I met her last year, she mentioned that she had applied for resettlement to the United States. Several months later, she called me after her resettlement interview, depressed and agitated. For someone like Berivan, who was severely traumatized by the war, the probing interview for resettlement had been brutal. She was called back for another interview, but she couldn’t take anymore and did not believe that the United States would reunite her with her husband. So she risked her life and got on a rickety boat to reach Europe. They are now rebuilding their lives in Germany. I suppose she made the right choice, but the United States lost a hero. I was saddened by this story, but I was not surprised. 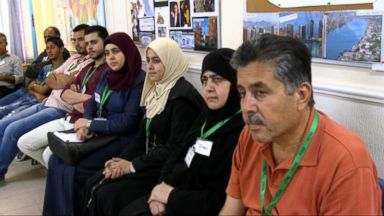 The process for any citizen of a Middle Eastern or majority Muslim country to get into the United States is tortuous and has become more so every year for the past 15 years, with additional screenings, interviews and other background checks. When I started, DHS officers interviewed four Syrian or Iraqi refugee cases per day; they now interview only two per day to accommodate the range of questions and additional checks that have been added to the process. While the average wait time for refugee resettlement is 18 to 24 months, Iraqis and Syrians typically wait several years. The process starts with the United Nations’ refugee agency (UNHCR). The UNHCR conducts a series of interviews and screenings, including home country reference checks and a biological screening such as iris scans. Then UNHCR has to decide if a case is suitable for resettlement and which country an applicant can apply to. (Out of more than 65 million refugees worldwide, about 0.01 percent were resettled to the United States last year.) Another international organization assists with resettlement processing by collecting documents and conducting more interviews with the families, looking carefully for discrepancies. By the time Homeland Security steps in to conduct an interview, the officer already has a stack of biographical information on the refugee. Ironically, Iraqis, Syrians and Iranians, who are all now barred from entering the United States, are far and away the most well-documented refugees we interview. I typically had to review a stack of high school degrees, baptismal certificates, marriage and birth certificates, honors and awards, photos with U.S. service personnel, recommendations from American military members, and conscription booklets or cards, which every man in those countries had to carry. Since the United States has been in Iraq for more than 10 years, the government has a plethora of information on Iraqis — in many cases, terrorists, criminals and persecutors are recognizable and denied. In one instance, because we had this information, I knew that a man had worked with Saddam Hussein’s intelligence agency for years and potentially tortured people and, because of checks already in place, that person’s application was denied. The officer then conducts a detailed interview. We record every word to match it up with other documentation and past interviews. Some refugees were so fearful of forgetting some detail of their lives that they brought notes to the interview to remember everything exactly. Applicants have been reprimanded or denied for having those notes because of concerns that they are fixing their script. Every detail of their case is pored over and exhaustively analyzed. In one instance, while reviewing a case, I came across a report of a refugee who had handed someone a piece of fruit at a checkpoint. The incident was thoroughly investigated to see if the person had provided material support to a potential terrorist organization. Our government then performs its own intensive screening. The refugee applicants’ information and fingerprints (also taken by Homeland Security officers) are run through the databases of nine law enforcement, intelligence and security agencies and matched against criminal databases and biographical information such as past visa applications. Behind the scenes, officers and supervisors of varying political stripes debate and discuss each case endlessly. At U.S. Citizenship and Immigration Services headquarters, officers conduct more research, reconciling multiple interview notes, country conditions and background checks. They are trained to spot “red flags” or issues that might make someone inadmissible. If a national security threat emerged, certain nationalities were placed under tighter scrutiny. If you’re bored by now just reading about the process, imagine a refugee waiting years in a camp, freezing in tents and unable to put their children in school. Some continue to receive threats — and some of our applicants were killed while waiting. Supporters of Trump’s order argue that this ban is temporary, but they do not understand the consequences of this stoppage for refugees. Before the war in Syria began, I met Laith, an Iraqi refugee, who had fled Iraq to Syria when members of a militia group attacked him and his family. But he still was not safe. Someone claiming to be with the Syrian government threatened him. He was forced to move from house to house for months to escape death until the United States resettled him. If the Trump ban had been in place, even temporarily, Laith would have likely been killed. Aside from the imminent danger many applicants face, this stop on refugee resettlement presents another issue: These security checks expire, which means that, if delayed, applicants will have to begin the process again. That will, in turn, delay the process for incoming applicants, creating a huge backlog in the system. About 60 percent of the 11,000 Syrians resettled last year in the States were children. The forthcoming delays could consume entire childhoods. Those who had been approved have likely sold all their belongings in preparation to move to the United States. Even before this extreme vetting process was established, refugee resettlement did not represent a huge threat to Americans’ safety. According to a report recently released by the conservative Cato Institute, out of millions of refugees resettled to the United States over several decades, just 20 have committed or attempted attacks. They only managed to kill three people — all in the late 1970s before the creation of the modern screening system. The annual chance of being killed in a terrorist attack committed by refugees is 1 in 3.6 billion a year. Not only does the executive order provide no logical benefit to national security, such policies feed into the extremist narrative that America hates all Muslims and actually hurt national security, as argued by Michael Hayden, former CIA director during the George W. Bush administration, and other government officials. All this information is available to Trump. The only explanation for this order is that refugees are being used by the President to appeal to his base at the expense of U.S. security. Such a move is not only despicable and devastating to the people who desperately crave the safety of our country — it erodes the American legal system by turning it into a political tool.